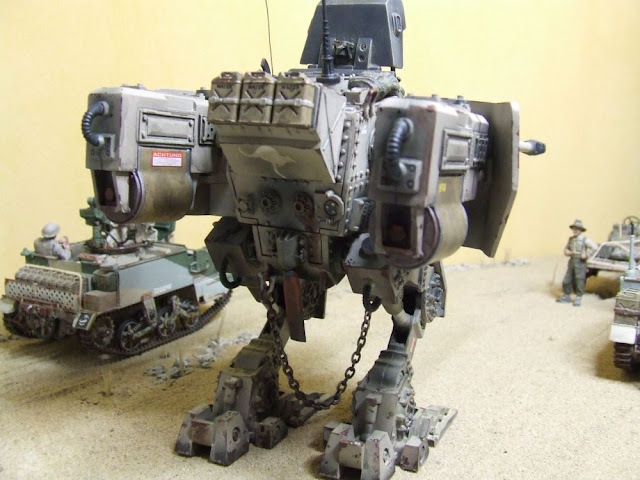 This is a build I have been working on and off on for the last 12 months , I only had just returned to modelling since leaving it in my teenage years and am a member of a die cast armour collectors forum that also has a healthy modelling fraternity , after salivating over some of the builds there I raided the local model shops and at the age of 45 re birthed my old hobby. DUST is a "What if world", a fictionary world based on our true history and mixed-up with science fiction, created by Paolo Parente. The difference is that amongst them we find Nazi Germany and their Axis allies, who were the first to develop new weapon technologies at the end of 1944, ending the war in a different way compared to history. In June 1948 a German merchant vessel was intercepted off the coast of Madagascar , it was carrying the new walking armoured units from Germany and other high tech weapons. 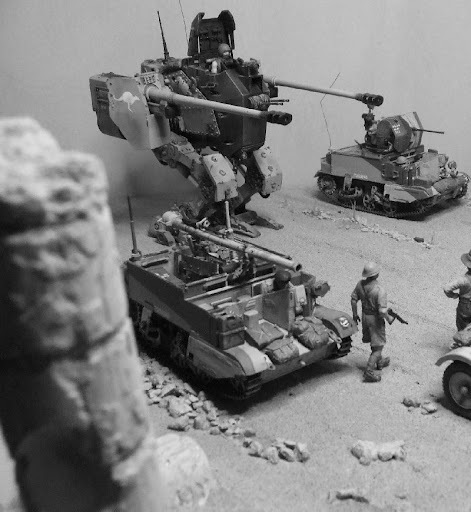 My build will feature a Jagdluther walking bot from Dust models ( http://www.dustgame.com/products_d.php?nid=2&id=22 ) that has been captured and re fitted by the Aussies in Libya in 1949 , also in this diorama there will be 2 modified Universal Carriers fitted with German and American modern weapons , as an after thought I also will be using a Tamiya SAS jeep that was originally bought for parts . Flak 38 " Fernwaffenstation "
Dragons Flak 38 kit was a pleasure to build and is highly detailed with PE parts as well. I left off some parts like the gunners seat , won't be needing the trailer or base it goes on as I'm building a custom tower for it to sit on in the Bren. 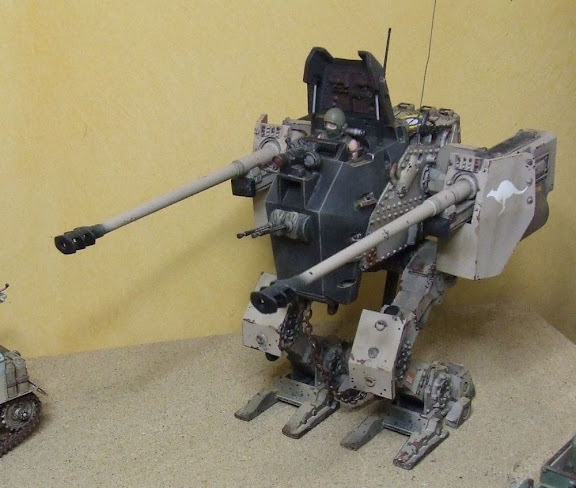 If you look closely you will see 2 green cylinders where the manual winder handles were , these are my scratch built hydraulic servos which now power the gun , they come off the M113 kit and they are the tops off recoiless rifle ammo canisters I think. 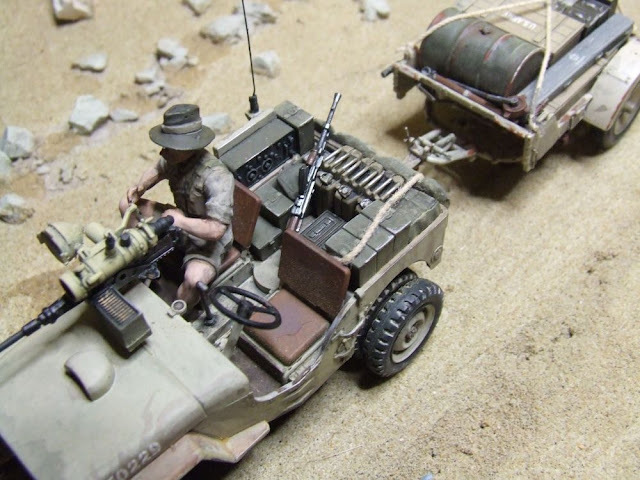 Universal Carriers " Dan " and " Jim "
SAS Command Jeep " Special "
Quite proud of this semi scratch built trailer I made from spares it came out a treat I reckons , for anyone interested I post up what parts I used , the trailer is from Dragons Flak 38 kit and was that nicely detailed I didnt want to waste it so I added a deck made from a spare engine cover from an Academy M113 kit ( the angled bit ) , next part of the deck over the axle and that mounts the gun is from an Airfix 1/72 Bofors gun tractor kit , it fit perfectly with no trimming needed , the sides are also from the Airfix kit. 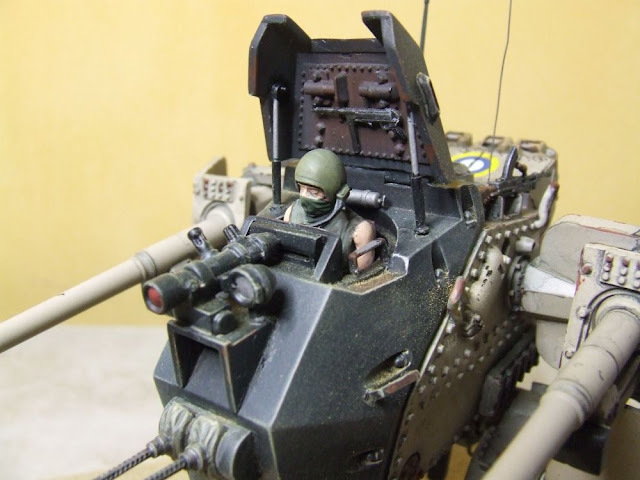 On the back I stuck a spare tool box from the Tamiya Bren Carrier kit and put 2 handles there from the Flak kit. Some interesting builds in progress there, look forward to seeing how they progress. 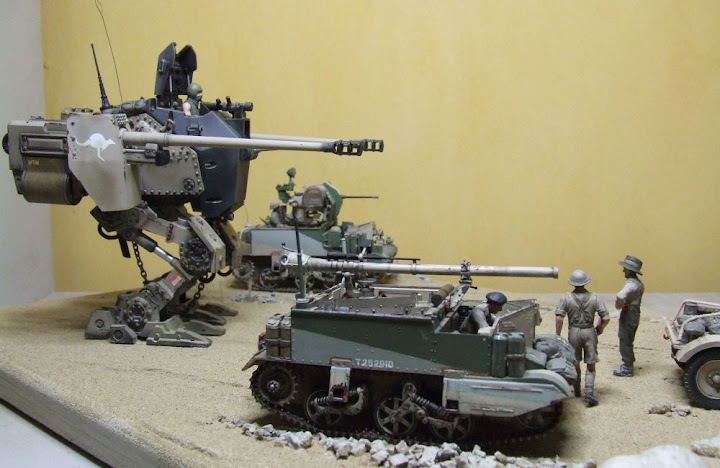 I have been looking at the Dust Tactics stuff cause I thought it was 72nd scale (my scale and cheaper) but looks like they are 48th. Still, lots of potential. Been thinking the "Pounder" would look good with some turret mods and Israeli markings. The dio isn't going to be much as there is plenty to look at already , I needed something with height though to counter balance the bots height , was originally going to be a palm tree , but I can't find a decent looking one in 1/35 and I'm not gonna make one , so I settled on a bit of reliable building ruin ala ancient temple , after looking at Ebay for kits and not finding something cool looking I decided to make my own out of Polyfilla plaster . I cast some bits up using the plastic molded tray that the bot parts came in , it had a few nice looking shapes so I just spooned the plaster straight into em , for the column I used an old Berocca container , filled her up with plaster and not fully mushing it all in as to leave air bubbles in the mix , this looks like the pock marks caused by wind eroding sandstone me reckons , came out a beauty ! 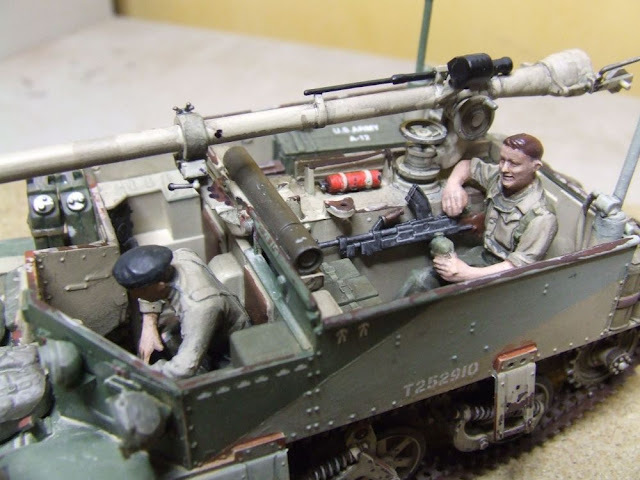 Operation Glenrowan Libya 1949 - under the cover of darkness mobile units from the 8th Cav Australian Army strikeforce " Kelly " momentarily pause at an old temple ruin to meet up with ground troops. The target - a clandestine German jet fighter base hidden in the desert wasteland , the Australian troops have a big surprise for old Jerry this time - a captured Jagdluther " Skorpion " AT walker , one of 9 seized from a merchant vessel off the coast of Madagascar some months earlier. 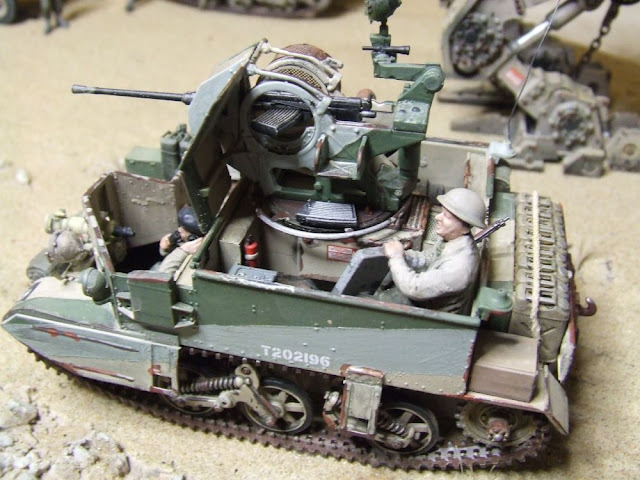 The Aussie engineers have also been busy fitting out 2 Universal carriers with new American engines , German night vision equipment and arming them with a captured German remote Flak 38 , new American recoiless anti - tank cannon and Magnetic Anomaly Detection system.